IAEA officials tour the grounds of the Fukushima Daiichi nuclear plant on Friday, May 27, 2011. 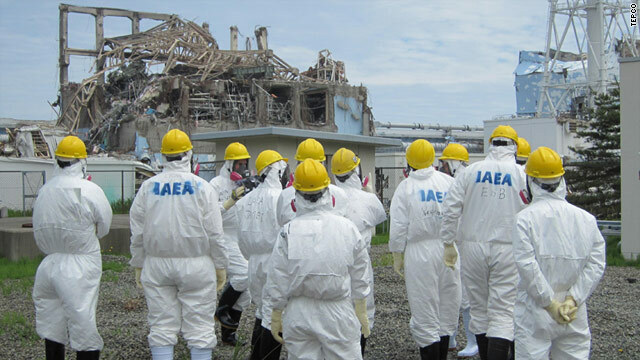 Tokyo (CNN) -- Officials of Japan's hard-hit Fukushima city will begin handing out radiation measuring devices to 34,000 children in a plan to help calm fears about radiation. Fukushima city is located about 60 kilometers (37 miles) from the Fukushima Daiichi Plant, which experienced full meltdowns at three reactors in the wake of the earthquake and tsunami on March 11. The measuring devices, called dosimeters, will be given to the children for three months starting in September, officials said. "We received the voice from the parents and citizens concerned about radiation exposure of the children. We decided to distribute them for the safety and assurance," said Masazo Kikuchi, officer of the city's education board.